Rene Russo and Jake Gyllenhaal in VELVET BUZZSAW. Courtesy of Netflix. Writer-director Dan Gilroy’s VELVET BUZZSAW is a wickedly delicious, satirical take-down of the art world that’s about as deep as a puddle, but a wonderfully wild ride nonetheless. It’s seemingly designed as such. His cutting commentary is more akin to a paper cut versus a stab wound. Its obvious interest lies more in being a mirror, reflecting the narcissistic culture that routinely births and kills its darlings, than in being a multi-dimensional meta-commentary on the industry it skewers. Think of it as a shift-change from NIGHTCRAWLER. That said, it’s an uproarious, riotous hoot seeing the insufferable types and the scene they populate perfectly lampooned as the auteur’s sharp tongue and cynical wit are evident within the building absurdity. The striking discovery of a talented unknown artist has the power to draw the attention of people in the art world, but it usually doesn’t end in (cue ominous musical stinger) their murder. High-strung gallery assistant Josephina (Zawe Ashton) is having a rough go at life when she stumbles upon a dead body in her apartment complex. Her artist boyfriend has just left her for another woman and she’s stuck in a menial position at a hot gallery run by demanding, desperate and morally destitute owner Rhodora Haze (Rene Russo). Under the pretense of helping to save her deceased neighbor’s cat, Josephina enters the apartment and uncovers a bounty of valuable artwork– paintings that highlight the madness and tortured psyche of its artist. Some of the work was left unfinished while others were resigned to a pile of ashes in the fireplace. Viewing this as her opportunity to legitimize herself, Josephina flagrantly disobeys the artist’s wishes to have his work destroyed and brings her findings to her on-again/ off-again flame/ snooty art critic Morf Vandewalt (Jake Gyllenhaal). Naturally Rhodora finds out and threatens to end Josephina unless they launch an exhibit together. They soon find out that the mystery artist, Ventril Dease (Alan Mandell), was a disturbed, deranged man with a checkered, highly troublesome past – one that, if exposed, could end his career as quickly as it ignited. However, that won’t be a problem as a metaphysical, vengeful spirit begins possessing the art and killing everyone who stands to profit off the deceased artist’s paintings. 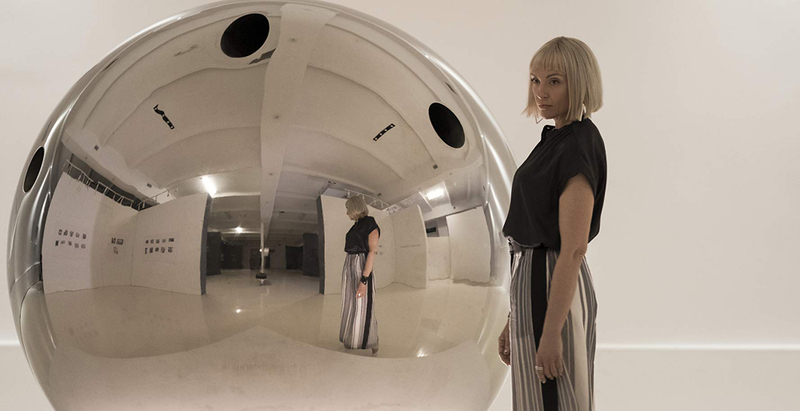 Toni Collette in VELVET BUZZSAW. Courtesy of Netflix. Every type of art world persona is spit-roasted on Gilroy’s rotisserie, even the clientele who surround themselves with acquired artistic achievements. He sneaks that statement in with Rhodora’s arc, when her sculptures and trinkets try to kill her one treacherously windy evening. The characters caught in his crosshairs are those who broker and judge the artistry of others’ creations – people like art critics, gallery owners and anyone with ill-intentioned notions. The off-kilter atmosphere is further augmented by Isis Mussenden and Trish Summerville’s costume designs, giving it a palpable quality not just with the mixed mediums of the fabrics used, but also their daring print combinations. Gilroy shoots all of this through a highly comedic lens, utilizing his creations’ bitchy behaviors to amp up his absurdist notions about how art is subjectively quantified – both for the artist (it’s a bit of themselves poured out onto a canvas) and the beholder (we project our own emotional experiences onto the pieces). As a result, when these types begin getting picked off, there’s a sense of satisfaction and glee. While the artists like Piers (John Malkovich) and Damrish (Daveed Diggs) are portrayed as the victors, heroes unto themselves, Gilroy makes his statements sting in the victims’ self-made plights. Morf is an easily recognizable, self-involved writer. His arrogance is virtually meme-able, reflected in phrases like, “Critique is so limiting and emotionally draining,” “I further the realm I analyze,” and, “I am not your mouthpiece,” which is yelled at a gallery owner whose show tanked because of his review. Squirrely, selfish social climber Josephina doesn’t exactly inspire empathy either. Tertiary characters like art exhibit installer Bryson (Billy Magnussen), competing gallery owner Jon Don Don (Tom Sturridge), and sweet, naive Coco (Natalia Dyer), whose job displacement is this film’s running joke, are also given a good flogging. But perhaps the film’s most indelible sequence is bequeathed to museum director-turned-advisor Gretchen (Toni Collette), whose death unwittingly becomes part of a “what is art?” gag. As a kissing cousin to THE SQUARE, though no less droll or colorful with its sentiments exploring artistic expression, Gilroy’s feature does what any provocative work of art does: stir a visceral response in the eyes of its beholder. It’s a fascinating concept to see art literally become the cause of death for his artistic creations. However, the on-the-nose qualities of his argument occasionally detract from the conversation. Still, its trashtastic sheen and pitch-black humor make it a gonzo delight.